ALBUQUERQUE—The Albuquerque Convention Center (ACC) in conjunction with Doug Aurand have created a 360° Virtual Tour of New Mexico&apos;s largest meeting facility. 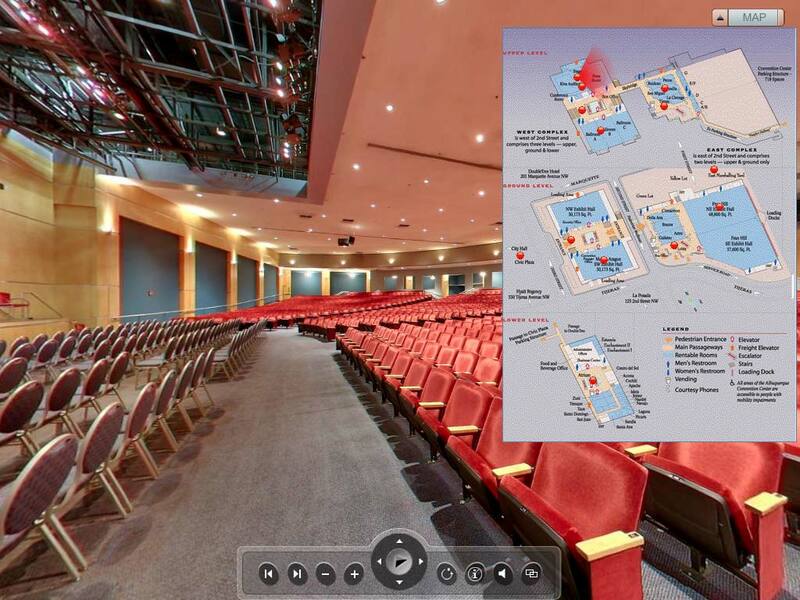 The virtual tour lets visitors feel like they&apos;ve stepped inside the Kiva Auditorium, Exhibit Halls, Ballroom and other meeting space, online. 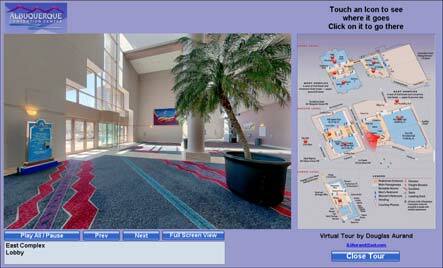 The “Virtual Tour” of the Center is now available for viewing on line at www.albuquerquecc.com . The tour uses an expanded floorplan view of the 3 levels to navigate. Scenes currently include the West Lobby on Third Street, the Atrium from the Lower Level, Ballrooms 1, 2 and 3 combined and set up for a banquet, two views inside the Kiva Auditorium, the SW Exhibit Hall, the NE Exhibit Hall, meeting rooms Ruidoso, Pecos, Mesilla & San Miguel combined, the East Complex Lobby and East Upper Lobby, the Marshaling Yard and the West Upper Foyer with a view of Civic Plaza out the window. Still to be added are the smaller meeting rooms on the lower level of the West Complex. The Virtual Tour is powered by Adobe Flash which 99.9% of Internet users already have installed. The photography uses High Dynamic Range Imaging, a process that produces images more like what the human eye can see, even in low light like the Kiva Auditorium has. The high resolution allows Full Screen Viewing that makes meeting planners and convention organizers feel like they&apos;ve stepped inside the pictures. Touch a red dot and a text hint tells you where it goes. Click on it and the 360° spherical image of that location appears next to the floorplan. The images spin in sync with the "radar" on the floorplan so the visitor knows what direction they&apos;re looking. The visitor can take control by clicking and dragging in the image, turning left and right, looking up and down and zooming in and out. Click the "Full Screen View" button and the 360° scene pops open, filling the computer screen. The floorplan is laid over the image and can be closed with a click, offering a better view of the space.